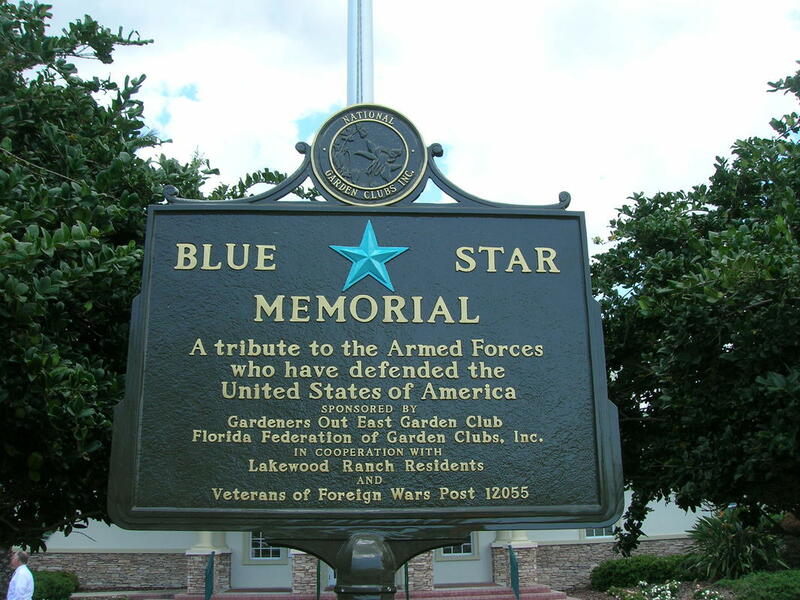 The Blue Star Memorial Program, sponsored by National Garden Clubs, Inc., began in 1944 as a living memorial to veterans of World War II. It has expanded to honor all armed forces. Permission to do this project was granted by Community Development District 2 (CDD2) who owns the land upon which Lakewood Ranch Town Hall is built. The Inter-District Authority (IDA), and the other CDDs were alerted to our project and all were enthusiastic that this memorial is located in the heart of Lakewood Ranch. Below is a photo of Gardeners Out East Blue Star Memorial plaque that has been erected and was dedicated on Sunday, May 28, 2017, at 2:00 pm. ​Gardeners Out East's First Annual Charity Golf Tournament raised funds for this project. Profits from the tournament were donated to Vets2Success - click here to see the newspaper article. Carolyn Lowry-Nation (center) receiving Award 43 A-1 - Blue Star Memorial Marker Award certificate for Gardeners Out East at Brooker Creek Preserve on May 3, 2018 at the Florida Federation of Garden Clubs District VIII Spring meeting. Left to right: Kitty Wallace - FFGC District VIII Grants Chair, Carolyn Lowry-Nation - Gardeners Out East President, and Kathy Echevarria - FFGC District VIII Awards Chair.